A little awkward, but exceptionally powerful. 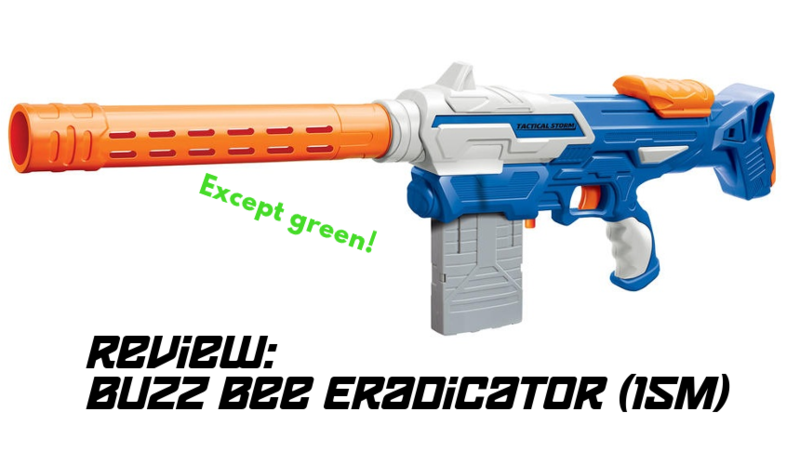 The Buzz Bee Eradicator is a recolour of the new and predominantly blue Tactical Storm. 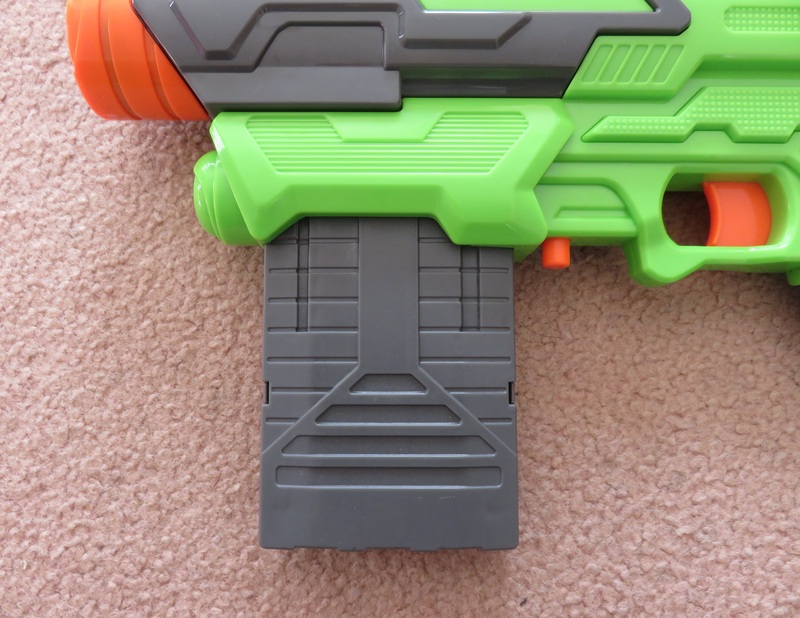 It is a modular mag fed blaster, not dissimilar in design to the older Champion/Ultra Tek 8. 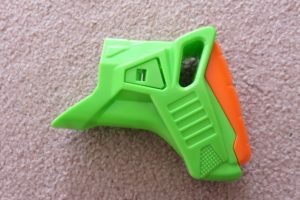 Given the excellence of that particular blaster, I was rather excited to give this new iteration a test. 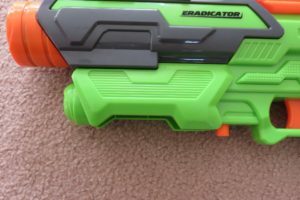 Pretty standard Buzz Bee style open box. A look at the muzzle. 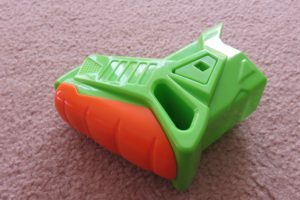 The base Eradicator is rather compact. 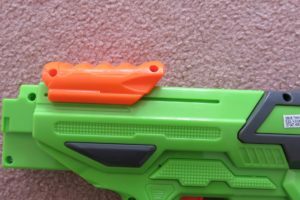 Like with the rest of Buzz Bee’s new releases, it features a number of extra shell details not present on older Buzz Bee blasters. 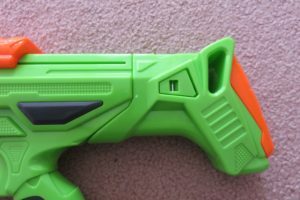 For instance, the patterning just above the trigger, or on the sides of the mag well. 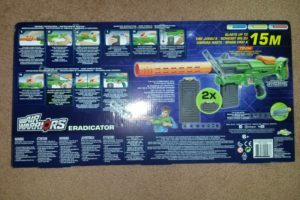 Additionally, the “Eradicator” name is printed on rather than stickered, and the plastic feels like a step up compared to older Buzz Bee blasters. All this combines to give the Eradicator a much more solid feel. 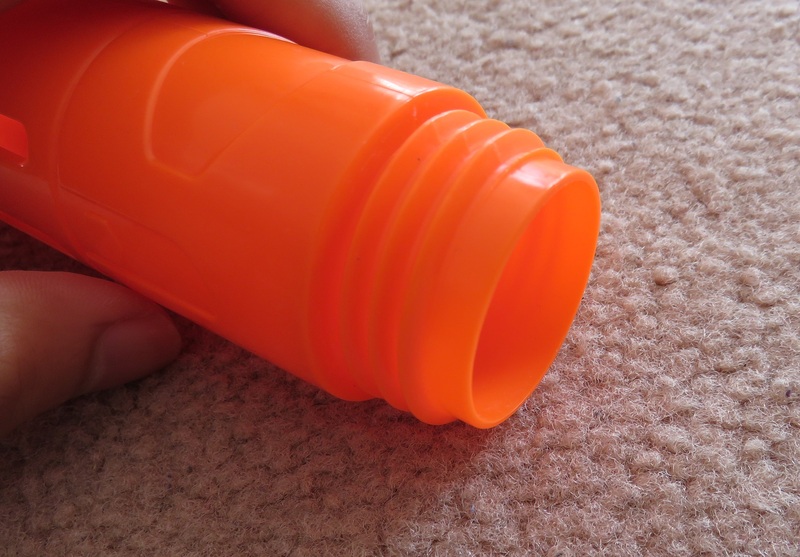 Closer look at the priming slide. Looking at the top of the slide. I personally find the Eradicator’s handle to be very comfortable. It is reasonably large, and has no odd angles or protrusions that get in the way. 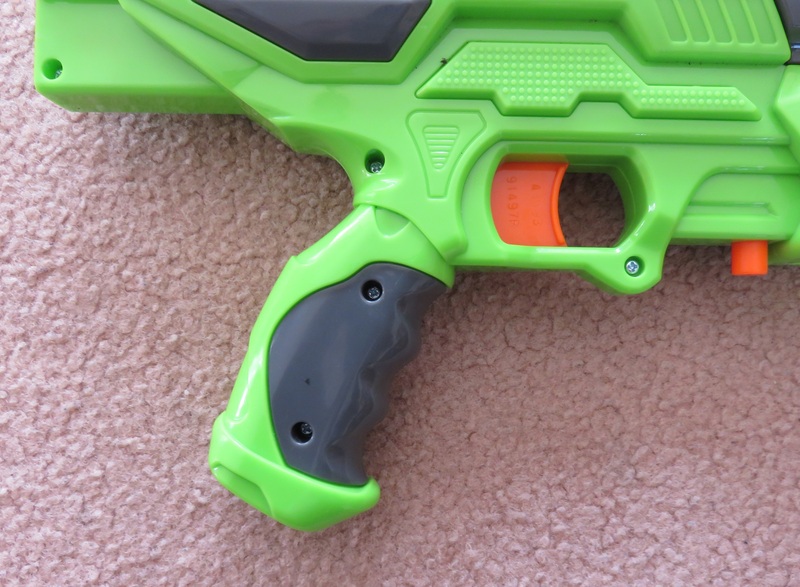 It is easily the best handle of the new wave of blasters. 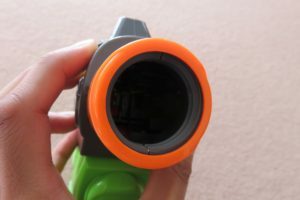 The Eradicator is operated by a top priming slide. 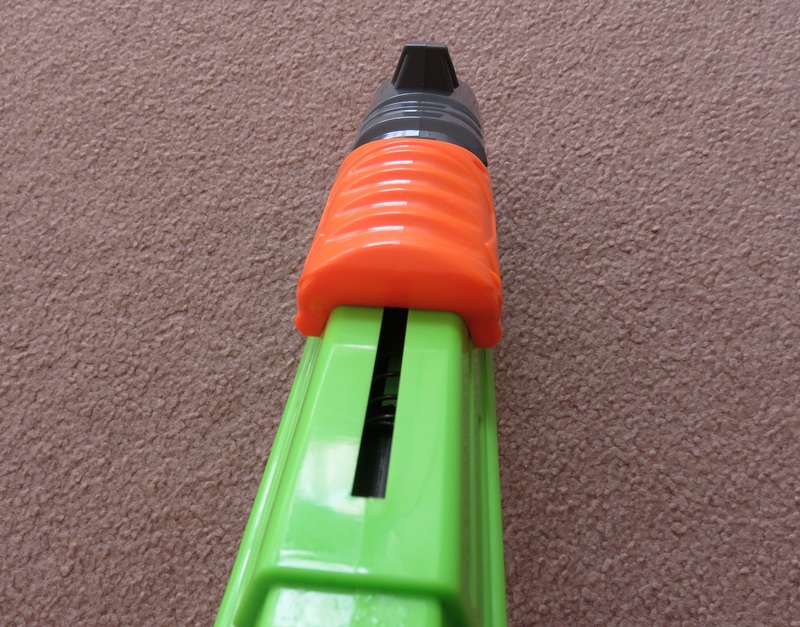 It is functionally identical to Buzz Bee’s Champion or Reaper, or of course the Nerf Retaliator. While it is fairly reasonably sized, I personally have a minor issue with it. 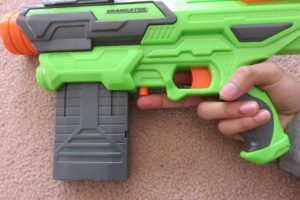 I find the priming slide to be situated a little too far backwards, making it slightly more awkward than say a Retaliator, whose slide is further forward. 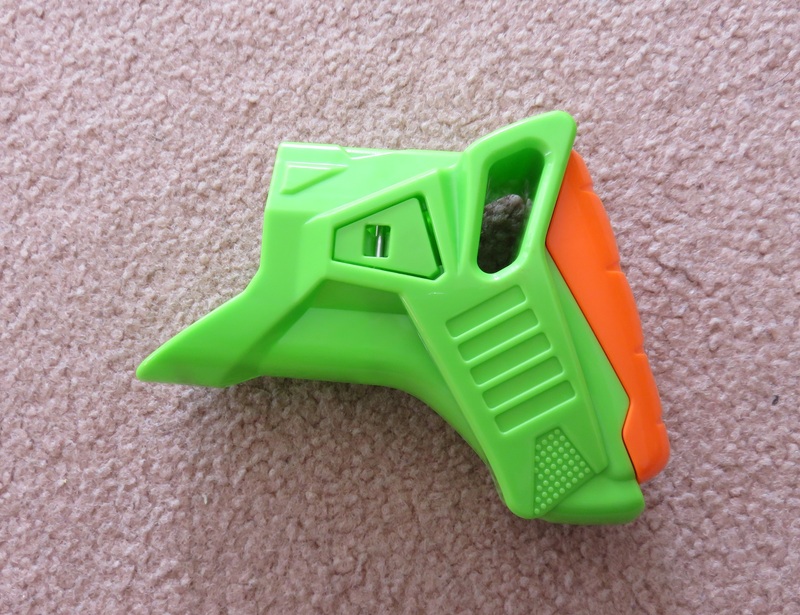 Mag loaded in the blaster. The Eradicator is of course a mag fed blaster, and a pretty standard one at that. 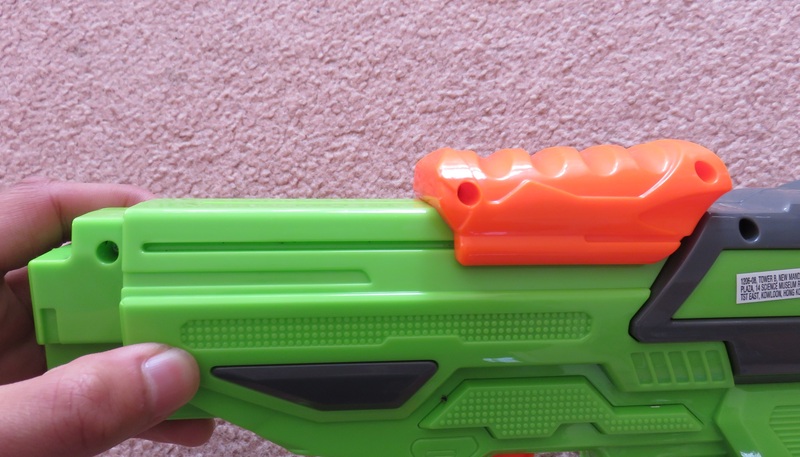 It uses the same cylindrical vertical mag release that most of Buzz Bee’s other mag fed blasters use. 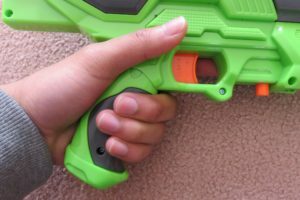 This mag release button can be reached at a stretch with your second or third finger, though this action can be a little awkward. A more conventional mag release would definitely have been preferred. 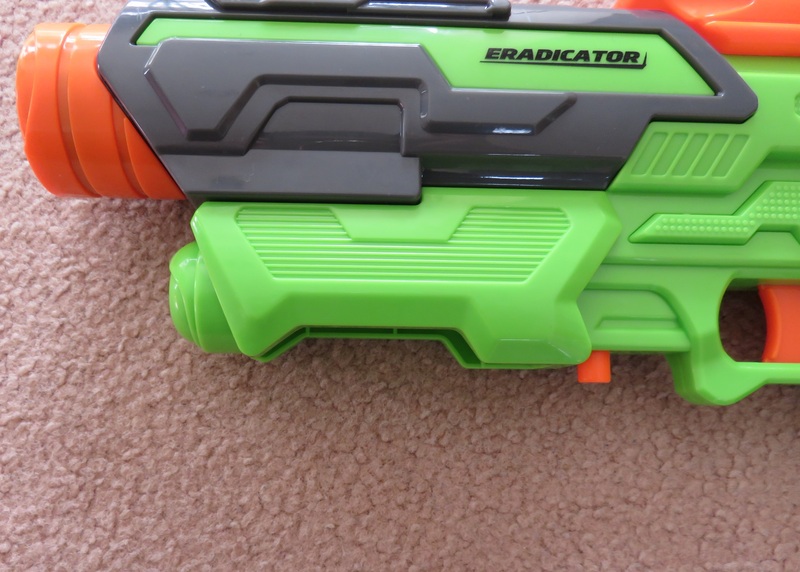 The Eradicator accepts both Buzz Bee and Nerf mags with no issue. 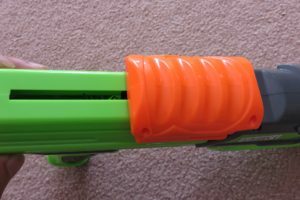 I have tried various Nerf mags with it, and have had no issues with any of them. 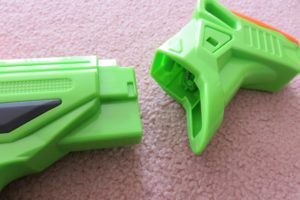 A look at the stock piece. 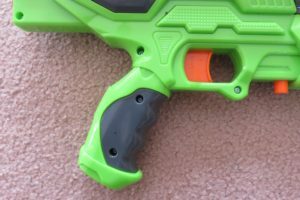 Another angle of the stock. 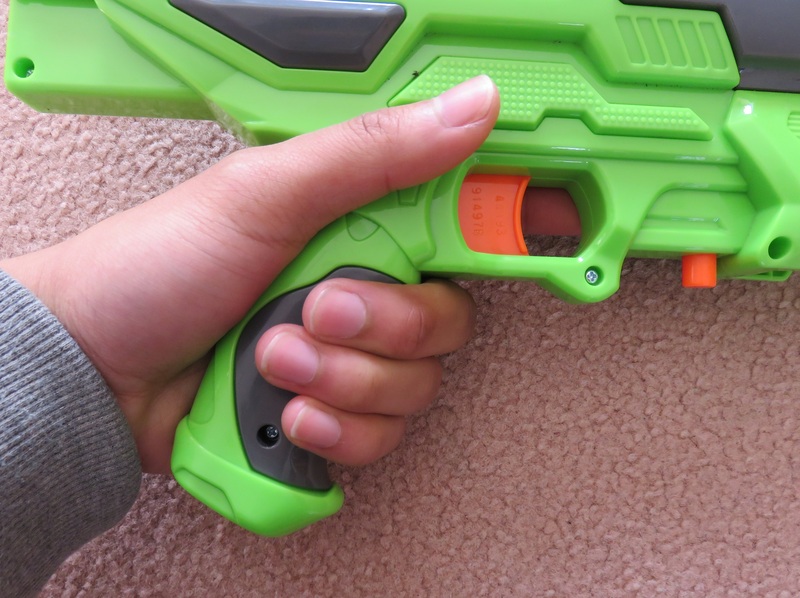 Showing the stock attachment point. 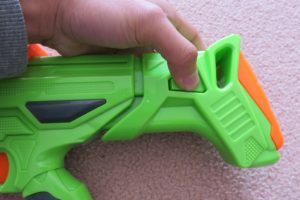 The Eradicator includes a detachable stock, which is unfortunately not compatible with any other Buzz Bee blaster so far. 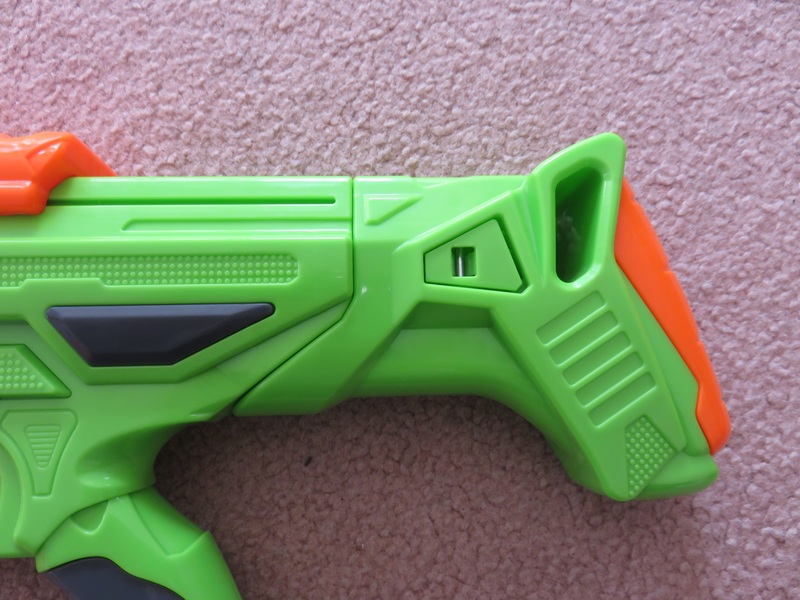 Unlike many of Nerf’s detachable stocks, it does not perform any additional functions. 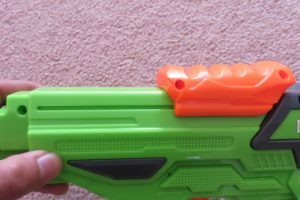 The stock slides on smoothly to the rear end of the blaster, and clicks into place. It is easily removed by pinching the two buttons on the stock, one on either side, and pulling the stock piece backwards. 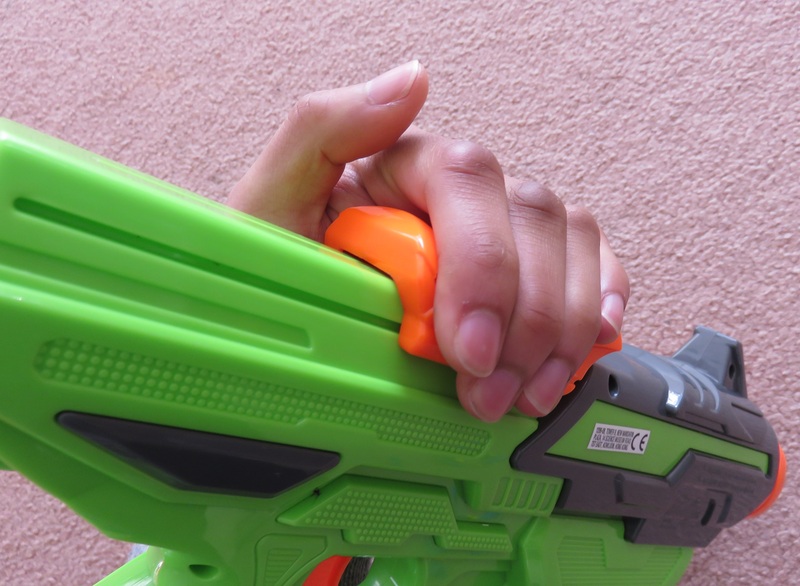 It is worth noting that the stock length is incredibly short. 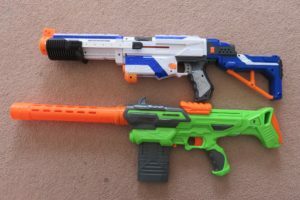 There is a photo of the Eradicator next to a Retaliator just below, and the Eradicator’s stock is a little shorter than the Retaliator’s. 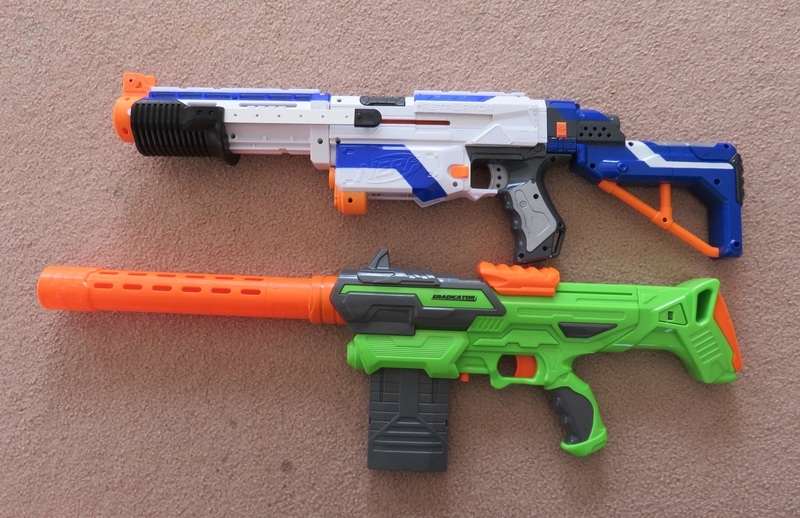 I already find the Retaliator stock almost unusably short, and I find the Eradicator’s to be even more uncomfortable. 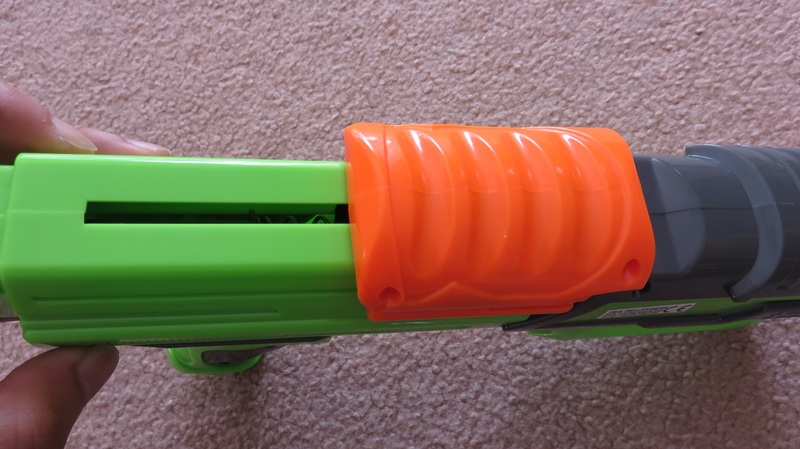 A look at the barrel. Close look at the threads on the end. 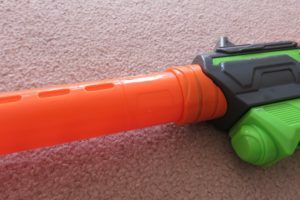 The Eradicator’s barrel is very similar to the detachable barrels from some of Buzz Bee’s other offerings, namely the Range Master and Snipe/Ultra Master Tek. 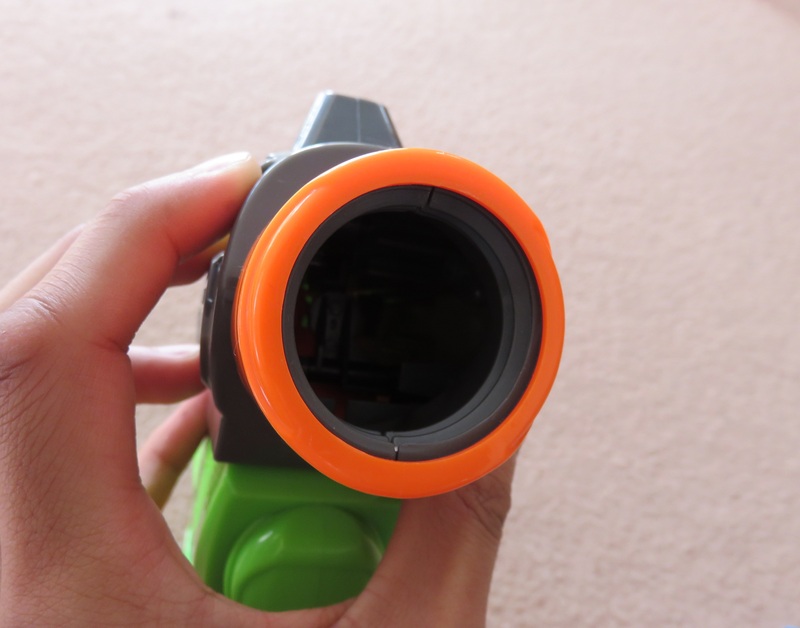 It is a simple, stylised tube with threading on the end to attach to the blaster’s muzzle. 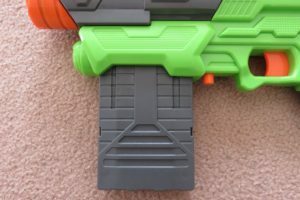 I believe this barrel may be compatible with the aforementioned blasters, and their barrels compatible with the Eradicator, but I cannot confirm myself. 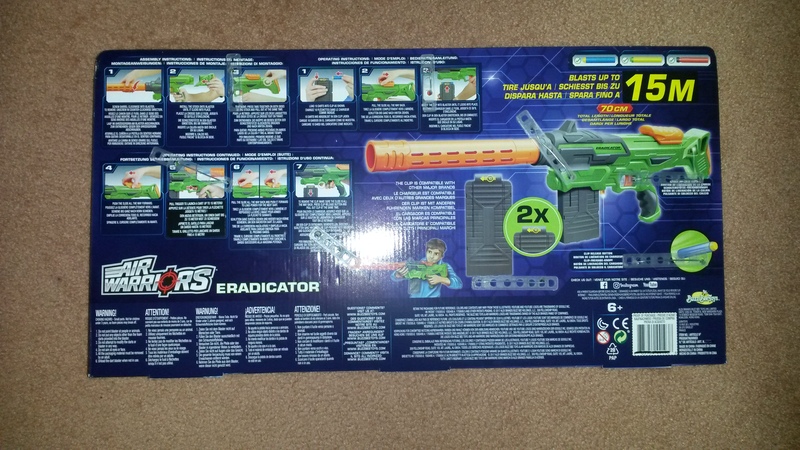 By virtue of its rather long faux barrel, the Eradicator turns out to be a rather sizable blaster. 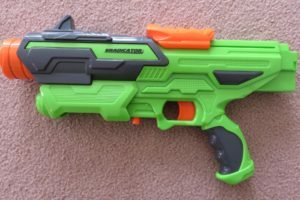 It measures approximately 70 centimetres long, a little longer even than a full Retaliator. 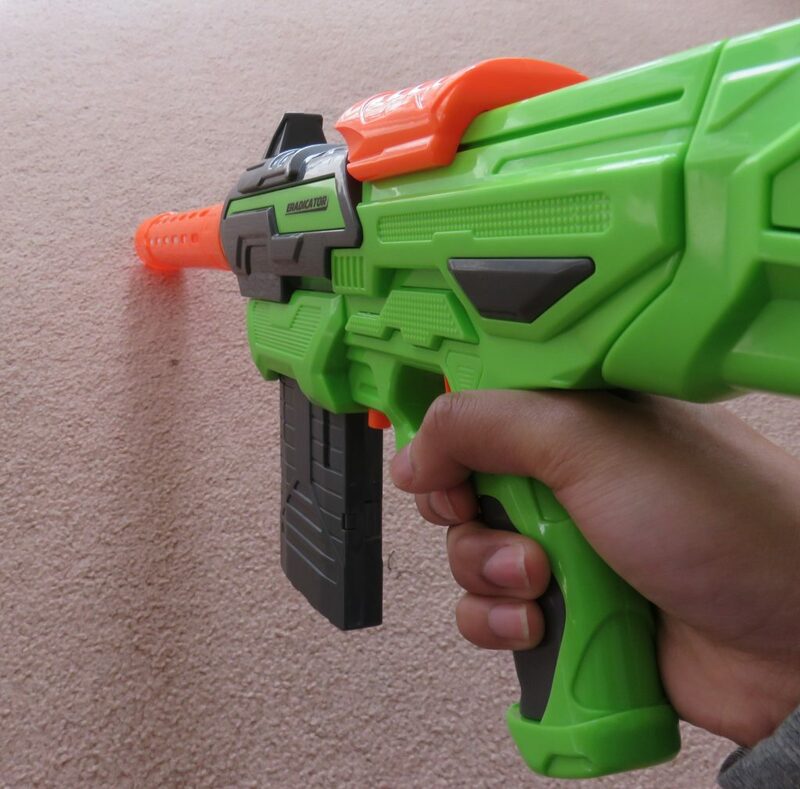 I personally find the Retaliator more comfortable to handle however. 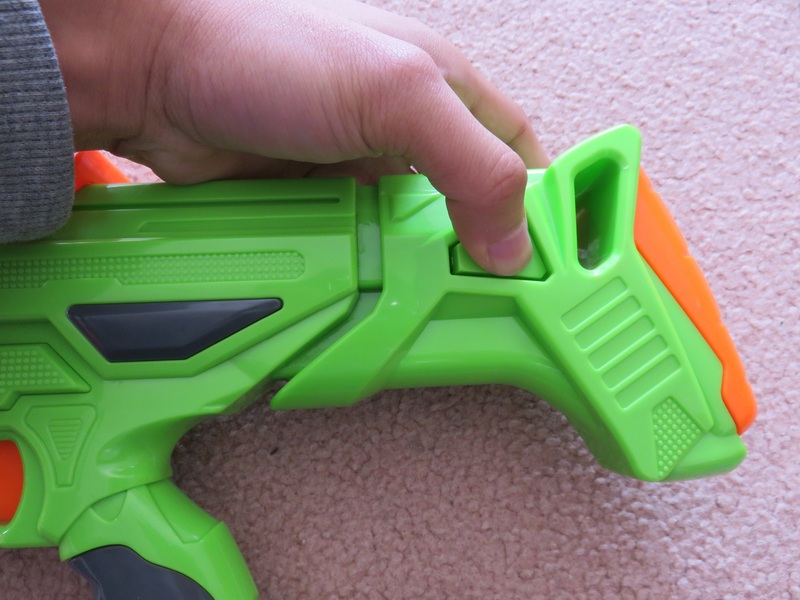 The Eradicator’s stock length is uncomfortably short, and its slide is quite far back. My chrono data can be found in my chrono document. 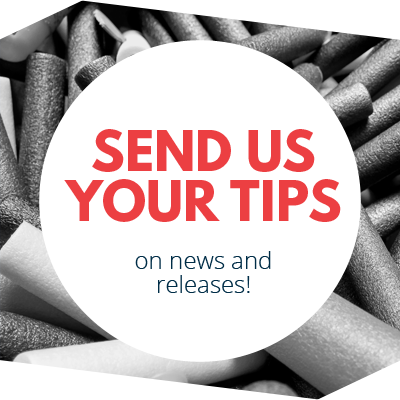 With the included Long Distance darts, the Eradicator averages around 85fps in muzzle velocity. This translates to around 15-20 metres of range, parallel to ground. 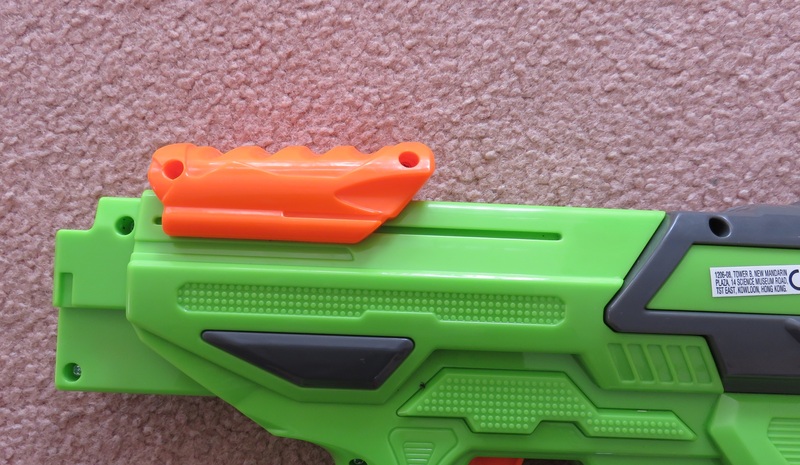 This is very impressive for a stock blaster, putting it above just about any stock modern Nerf blaster. Accuracy is highly dependent on darts. 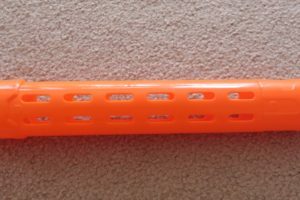 The included Long Distance darts are quite poor in this respect, and tend to veer off much like Elites darts. 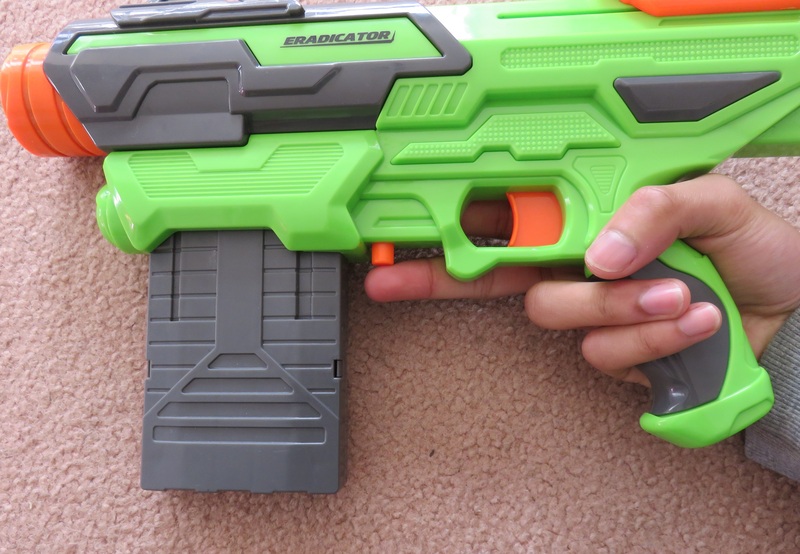 It is worth noting that I did not observe the barrel to affect the Eradicator’s performance significantly. 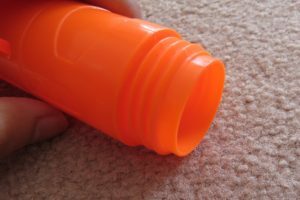 Although very long, it is also very wide and has many vents throughout its length. 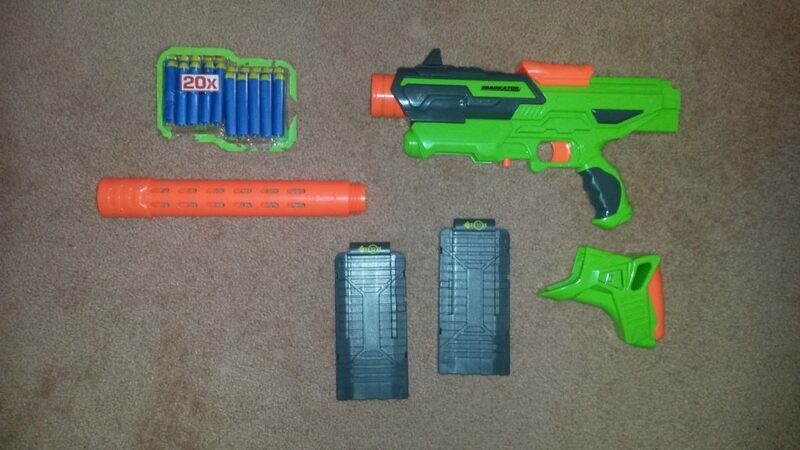 Rate of fire wise, I can achieve roughly 2-2.5 darts per second. 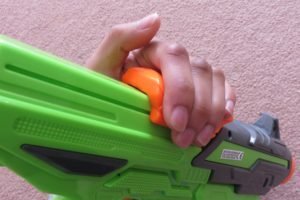 The priming slide is a little further back than ideal, which makes it a little more awkward to prime rapidly than say a Retaliator. 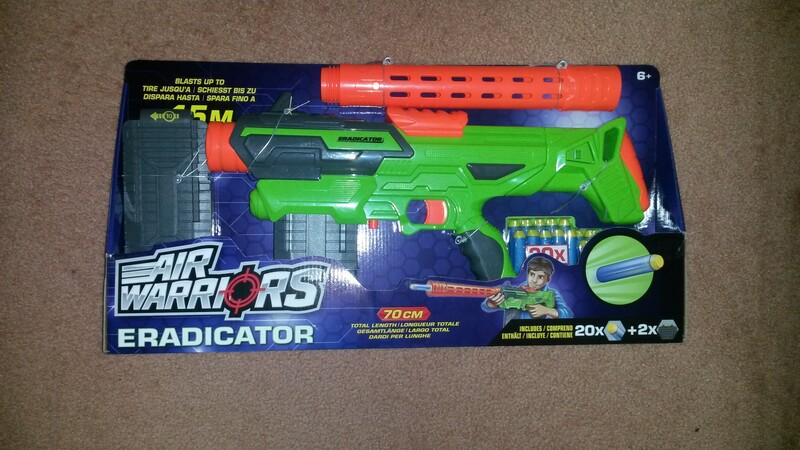 As such, I find the Retaliator to be capable of a slightly faster rate of fire. 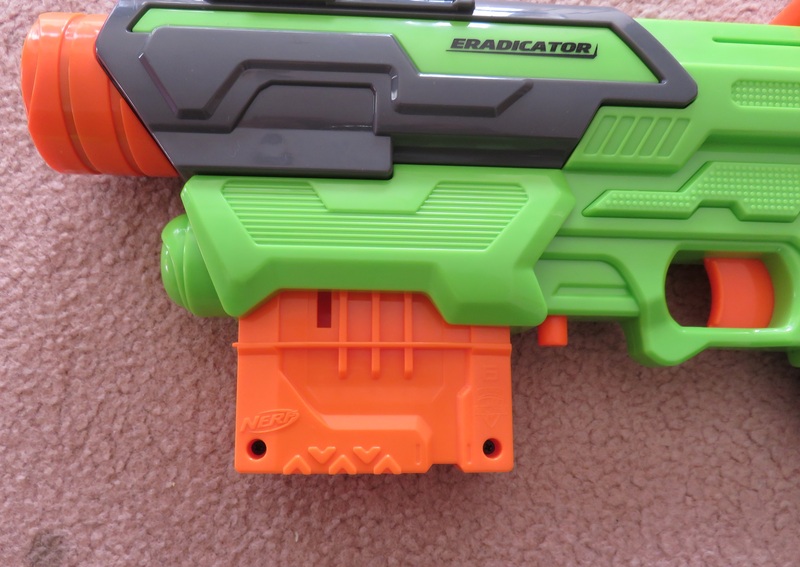 Without its attachments, the Eradicator is a very solid compact, manual action mag-fed blaster. 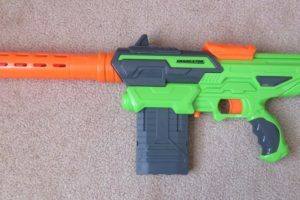 It is perfectly cross-compatible with Nerf mags, which allows it to function in essentially the same role as a bare Retaliator. 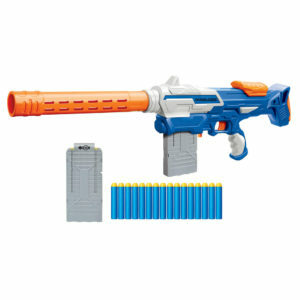 Its raw power in stock form is noteworthy, as it gives the Eradicator an edge over many other stock blasters. 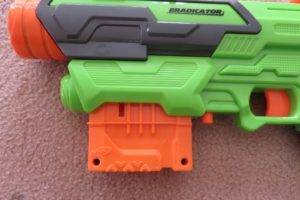 Its attachments however, are not as useful as the Retaliator’s are, and the Retaliator also has far more aftermarket part support. 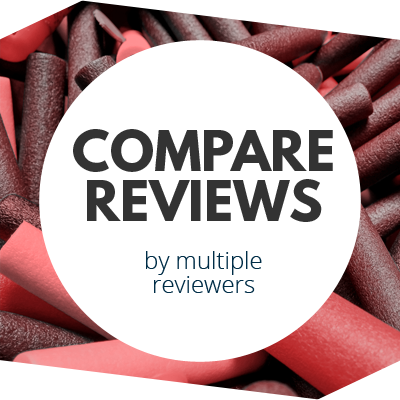 ROF wise, the Eradicator is decent, but is still easily outclassed by many blasters, such as most flywheelers and slam-fire blasters. 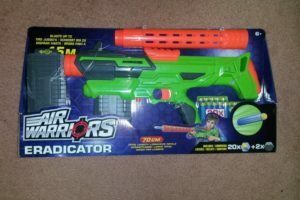 The Eradicator’s US-spec release, the Tactical Storm, retails for around 16-22USD depending on the store. 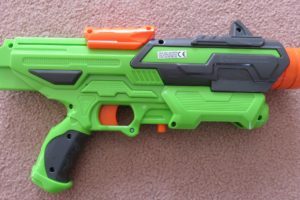 This puts it below the price of the Retaliator. For its price, it includes a lot of parts – a barrel and stock as well as two mags. 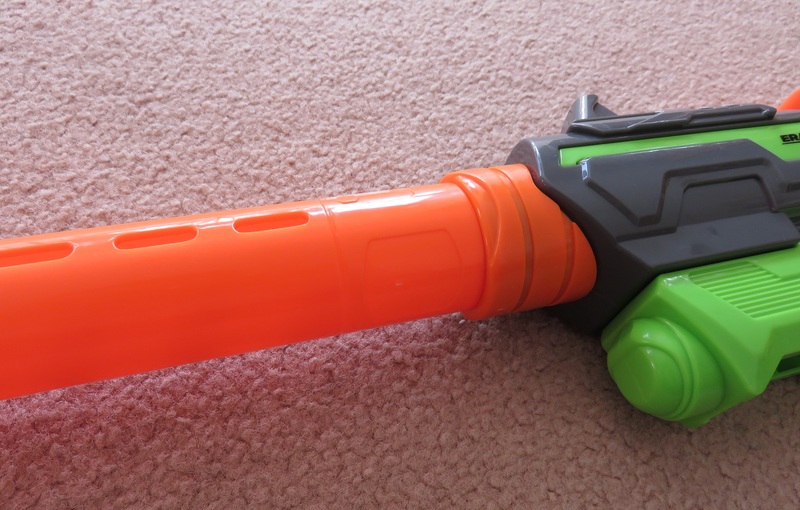 It is also a very solid blaster, and compares quite favourably with most other blasters in its price range. 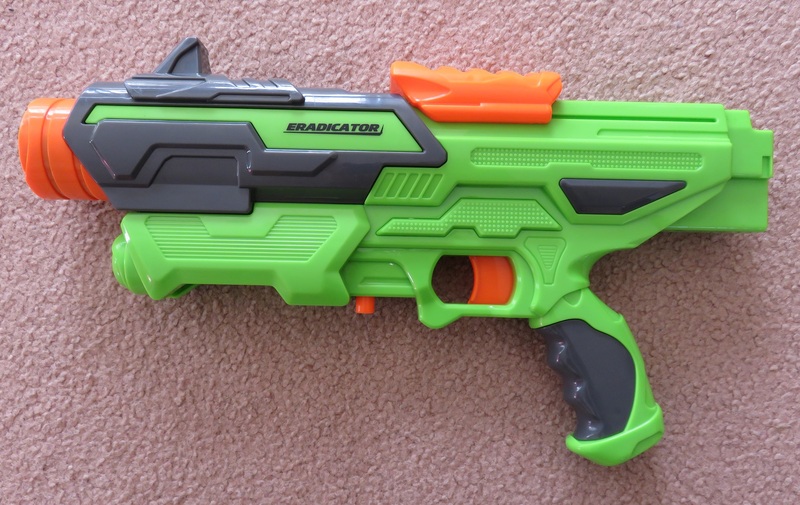 If you’re looking for a solid manual action mag-fed blaster, I’d certainly give the Eradicator a recommendation. 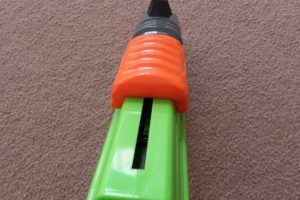 This entry was posted in Dart Blasters, Reviews and tagged air, australia, bee, buzz, eradicator, review, storm, tactical, warriors on September 1, 2017 by Outback Nerf.